The purpose of the Seminar of Criticism and Analysis Sessions is to provide students at the Elías Querejeta Zine Eskola with tools, as well as a certain perspective, for defining their professional lives after studying at the school. The event, organised by the EQZE and the San Sebastian Festival, will have the participation of professionals and specialists from different industry spheres who will contribute their proven experience to developing the students’ projects. The aim is to guarantee that the students’ projects will have greater strength at the end of their post-graduate programme. The Seminar will open on Tuesday December 18 with a double working session for students focussed on two questions. On the one hand, with Javier Martín, delegate for Latin American countries at the Berlinale and member of the committee responsible for assessing projects at San Sebastian Festival’s Europe-Latin America Co-Production Forum, they will study real cases and working material lending certain keys to success in the drawing up and presentation of project dossiers to labs and to public and private institutions granting financial aid for project development. On the other hand, with the bertsolari (singer of improvised Basque verse), writer and professor Xabier Paya, they will learn how to present themselves orally, a common practice at markets and festivals, where film projects must be defended before professionals. On December 19 and 20 a series of talks open to the public will be given by Thierry Frémaux (Director of the Lumière Institute, of Lyon’s Lumière Festival and of the Cannes Festival), Vincent Maraval (Founding Partner and Director of International Sales with Wild Bunch and Insiders) and Carlo Chatrian (Artistic Director of the Berlin Film Festival from 2020) who will talk about the place occupied by festivals in the film industry and culture promotion. To complete the Seminar, in 2019 a number of guests will put different subjects on the table. 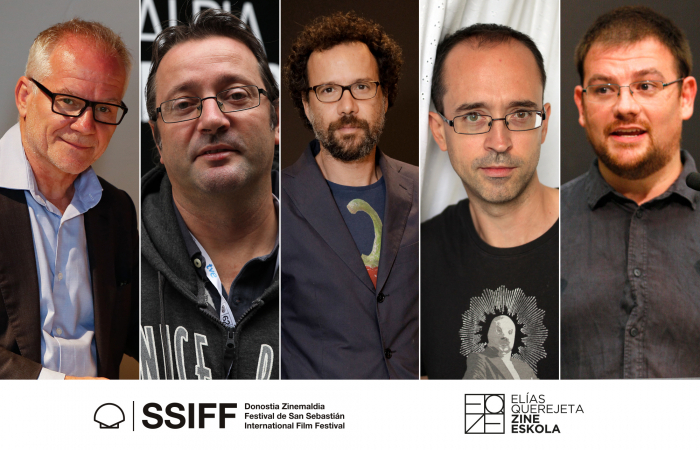 On February 25, Jérôme Paillard (Executive Director of the Cannes Marché du Film), Matthieu Darras (Delegate for Central and Eastern Europe at the San Sebastian Festival and Art Director of the Torino FilmLab) and Ilse Hughan (member of the HubertBals Fund HBF Selection Committee) will talk about the role and importance of film markets, festivals and the specific labs which promote the development of audiovisual projects. Domingo Corral (Fiction Director at Movistar+) and Chiara Marañón (Programming Director at Mubi) will visit the Elías Querejeta Zine Eskola on April 11 to discuss the new digital platforms from the point of view of both production and programming. That same day, Rosa Ferré (Director of Matadero) and Garbiñe Ortega (Director of the Punto de Vista Festival) will broaden the debate to talk about the so-called expanded cinema and new screens, and about all projects related to this artistic and curatorial practice which invite spectators into the cinema to discover other possibilities. The Seminar will close on June 19 with a table dedicated to the creation of production companies with the participation of Esther García (Producer and Founding Partner of El Deseo), Leire Apellániz (Producer and Founding Partner of Sr. y Sra.) and Marian Fernández (Producer and Founding Partner of Txintxua Films). The San Sebastian Festival participated in the conceptualisation and setting in motion of the Elías Querejeta Zine Eskola and sits on its Academic Board. It also teaches Curatorial post-graduate students the subject “Festival Under Construction” with the aim of debating with students and the professionals who visit the School the future of film festivals and, particularly, the future of the San Sebastian Festival.